Sisal Rugs are woven from natural plant fibers. They are strong, durable and due to their unique advantages, can be a lasting addition to a living room, bedroom, office or hallway. However, moisture and humidity can create problems on sisal rugs. If a large amount of liquid is introduced to the rug, the rug may actually shrink and distort. Also, the plant fibers absorb a liquid very easily and result in a large stain. For this reason, a sisal rug should be used in a dry place which is unlikely to be subject to spills. It is also important to keep this in mind when you clean a sisal rug. Be very careful with the amount of moisture used. If liquid is spilled onto a sisal rug, it needs to be removed immediately. To remove the liquid from a sisal rug, blot the rug with a dry cloth and keep blotting with dry parts until there is no more transfer of liquid to the cloth. Also, make sure not to rub the spill because this can drive the liquid into the fiber. If possible, you may find it helpful to lift the rug up and blot from the underside as well. If a staining liquid such as juice is spilled, clean a sisal rug with one-half white vinegar and one-half water solution. 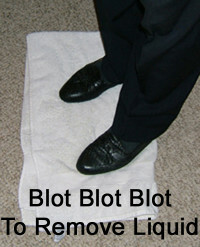 Dip a cloth in the solution, blot the rug, and then blot with a dry cloth. You may need to repeat this, but remember to use a small amount of water to clean a sisal rug so that the rug does not absorb the liquid. For dry materials, you can scrape it off with a blunt edge, such as a wooden knife. 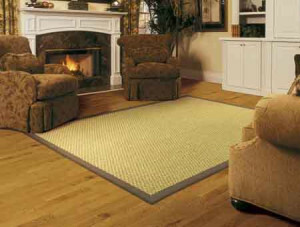 Finally, the sisal rug should be vacuumed regularly to take up accumulated dirt. If you vacuum a sisal rug on a frequent basis, you will also prolong the life of the rug, since embedded dirt tends to damage its fibers. If you are going to have a sisal rug in an area prone to spills, you may want to consider treating it with a fabric protector. However, pick a fabric protector that does not use water as its application medium.